A common question we get is about what travel gear we use. Well in order to best answer that, we put together this page with all of our travel gear. We’ll make sure to update it if we change any of the gear we travel with a recommend for others. The Osprey Farpoint 40 is our absolute favorite piece of travel luggage of all-time. It’s versatile, durable, and well-worth the price tag of $120. It’s the maximum size of a carry-on for most major airlines, which works out perfectly because you can pack everything you need for your trip in it and avoid checking luggage! We’ve packed for trips ranging from a weekend to 6 weeks using the Osprey Farpoint 40. There are numerous pockets, including a laptop sleeve. Mike has had his for about 5 years, and Becca has had her’s for a little over 2 years. Neither have any signs of wear, nor have there been any problems with the backpacks. Osprey makes lots of other great backpacks, but the Farpoint 40 is our favorite. 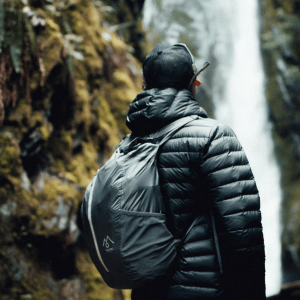 If you’re looking for a do-it-all backpack for yourself or a fellow traveler, this is our recommendation! While we love the aforementioned Osprey Farpoint 40, the Fairview 40 is the same backpack, but it is specifically designed for women. Becca has the Farpoint and it works wonderfully. However, if you’d prefer the Fairview 40, it’s basically the same backpack but with a slightly different build to better fit women. The entire backpack weighs next to nothing and can be rolled up into the size of a baseball. It also comes with a lightweight bag you can roll the backpack up into. This means that even if you aren’t wearing the backpack or using it as a carry-on, it will easily fit in your other luggage. While we have an older version of the Canon Rebel series, the newer Canon Rebel cameras will give you the better bang for your buck. There are plenty of camera options out there, but this is still one of the best. GoPro’s are the best action, weatherproof cameras out there today. We love our GoPro and bring it on all our travels. It takes amazing photos and videos with a fantastic wide-angle lens. We have the GoPro Hero 7 Black edition, but there is a newer version available too. The GoPro battery doesn’t last too long, so grabbing a replacement battery is almost a must if you are traveling with your GoPro. A few extra batteries with a charging station is ideal, so you’re not always having to recharge the same battery or put away your GoPro because it’s dead. We love our floating GoPro handle because if we’re ever in water and drop our GoPro, it’ll float. Luckily, this hasn’t happened to us, but it did happen to some of our friends who have the same handle. Thankfully, they were able to find their GoPro floating on top of the water! Although we will both admit that we should read more, Kindles are the way to go for traveling. The new Kindle Paperwhite is waterproof and includes extra storage! If you’re traveling internationally, a travel adapter is a must, especially in the age of technology. This travel adapter is compact, lightweight, and has plugins for all over the world. Plus, there are multiple USB ports, so you can charge more than one device at once! If you’re almost exclusively an Apple person, this might be the right travel adapter kit for you! It’s really efficient because the U.S. plug on a charger just pops off and the new plug of the country you’re goes on. Mike has this for his MacBook and iPhone. It’s super convenient, especially if you’re going to be in another country for a longer period of time. Plus, you’re MacBook and iPhone won’t take up space on your travel adapter because they’ll look like an Apple charger you actually bought in that country. No one wants their phone to die on them, especially when traveling, so why not get a portable phone charger. We’ve all been stuck in situations where our phone’s battery is dying faster than we anticipated and either need it to stay alive for directions or in case of an emergency, or we just want to take some extra photos and add to our Instagram story. Whatever the reason is, no one likes having their phone run out of battery. This can feel even worse when traveling because you’re not in a place you know, and you probably want to take pictures. This portable phone charger will solve your problem and quickly charg your phone. It even comes with a built-in cable, so you don’t have to carry around your’s. Headphone splitters area great gift for couple travelers, or the just traveling with friends. The small investment in this is totally worth it because a headphone splitter is way better than sharing earbuds when watching the same show. When packing liquids that will be allowed on airlplane, GoToob bottles are the way to go. They don’t leak and are very convenient when packing soap, shampoo, and conditioner on carry-ons. We always travel with a microfiber towel because it’s lightweight, doesn’t take up much space, and dries super fast. It’s a great purchase for someone who likes to travel because it can be used in so many ways and easily fits into any size luggage. Some of these links are affiliate links. We receive a small commission at no extra cost to you if you buy from these links.